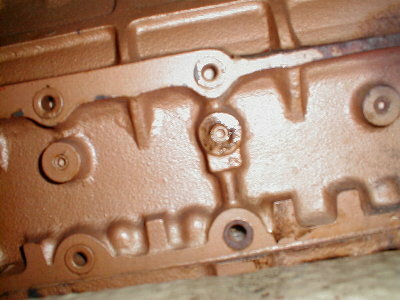 Small ports that look to be plugged with socket head set screws are access ports for the oil passage to the main journal bearings on teh crankcase. The one on the right is normally hidden by the oil filter. This one is serial number 315143 Earlier serial numbers used Press Fit Plugs that have been know to let go. Click here for the picture of one that let go. big improvement to the engine cooling system that now allows us to run at top engine speed (2840 RPM), for prolonged time periods. In mid Sept 02′, we motored @ 2680 RPM, for a little over one hour. Then we idled at 1000RPM for ten minutes, the temperature dropped to 160 deg F and then the oil light turned on. We immediately shut down and checked the oil level and it was full. After two minutes or so we started up again and observed that above 1300 RPM the light went out, and then above 1900 RPM the light came back on again. I thought this was very strange, maybe the wire grounded on something due to the engine vibrations, but that does not seem to be likely after looking at the wiring that never gets close to anything metal. Maybe the oil just got too hot and the relief valve turned on at 1900 RPM without closing fast enough. The next day the pressure light worked just fine, but we did not do any hard running. It happened again Oct 11th, and this time I was running at idle for 90 minutes then at 2000 RPM for 20 minutes, then back to idle and that is when it turned on again just like the first time. I shut down checked the oil and left it shut off for ten minutes (not long enough to decrease the oil temperature very much). After restarting, it worked OK; but I did not run at 2000 RPM for more than 3 minutes..
What are the failure modes for Oil Pressure Switches? I can imagine that the diaphragm could leak and prevent the switch from opening after the back side (air filled side) gets filled with pressurized oil. In this case I suspect that oil would be leaking out of the switch, but this is probably an anticipated failure mode so they sealed that part and to keep the oil in the engine. Next time it happens I was hoping to be able to check the pressure with an independent means. To do that I would like to identify a convenient place to attach a hose for an oil pressure gauge. We have a 1980, 32 HP, Universal 5432. 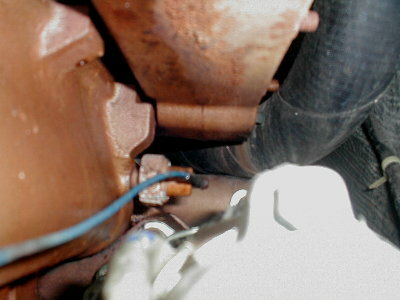 I have found that the oil pressure switch spot is very hard to access. There are three spots/bosses back from the oil filter that look like cleanout holes capped shut with socket head set screws that may well be taps into the pressurized oil galley. They appear to be right where the three internal crankshaft bearings should be located. On our 5432, the switch is located in the back just below the exhaust manifold and just above the starter and a little hard to get at. I am hoping to find another place that has a port to the oil galley that is more convenient for adding a temporary gauge. Click here for a buzzer on Oil pressure too low and or water temperature too high. it is part number 364L-F The manufacturer of the pressure switch is actually Hobbs Corp and they indicated that the symptoms we are seeing are likely to be frequent failure modes for the pressure switch. Some words of wisdom from guys who walked this path before. TEE for attaching a switch, sender, and/or manual gauge. After 900 hours the pipe broke right at the engine where its threads started. Instead attach a high quality hose rated for 100 PSI and run it to an engine room bulk head where a TEE can be added for the switch and sender. One person did use the set screws in the side of the block, but he reported that they were a real bear to break loose. Another fellow, Richard Kinard, reported that the center set screw came loose and fell out without provocation while motoring and pumped eight quarts of oil into the engine compartment. On November 24, 02′ an owner of a Cal 35 with a Universal 5432 reported very similar symptoms and plans to replace the oil pressure switch with one from NAPA as the Westerbeke distributor would have needed to special order it. In May 03′ I got the Universal part number 298663 Oil Switch from Torresen. The new switch solved the problem. The parts manual (publication 200147 edition 2) had it labeled Oil (sender) for serial numbers higher than 315023, but Joe Joyce confirmed that it is a switch. I’ll work on the pressure gauge idea in my next life.